He was 19 where he began to coach. 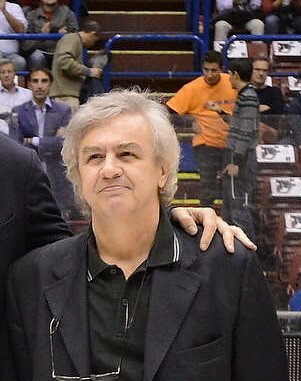 Franco Casalini was hired by the Social Osa, one of the most respected minor club in Milano, and he did well enough to be called up by Simmenthal. Casalini became quickly some kind of wizard of the youth teams, winning four championships for young men and raising a generation of Olimpia’s players eventually reaching the professional status, some of them in the Olimpia top team. Gradually, as an Olimpia’s personality, Casalini moved up to the first team, under Pippo Faina and then coach Dan Peterson, forming a terrific combination coach-assistant coach. As Peterson’s top lieutenant, he was part of all the great wins between 1982 and 1987. When Peterson retired, Casalini had his great chance. And he responded, In his first year as head coach, he won the Intercontinental Cup and the Champions’ Cup, the third in the club’s history, using McAdoo, Meneghin and Rickey Brown all together. The following year, he won the Italian league in the historical Livorno’s game 5. Casalini left Olimpia after the 1989/90 seasons. Eventually he coached Forlì and Roma, returned briefly in Milano, won the Switzerland championship running the Vacallo’s team, worked as a scout for Fortitudo Bologna. And still for everybody, Casalini, born in January 1st 1952, has always been an Olimpia’s man.